There are two minority Greek languages officially recognized in Italy’s south. Greko and Griko — both spoken by the “Calabrian Greeks” — are both timeless testaments to the ancient Greeks’ colonization of southern Italy in the 8th and 7th centuries B.C., some 2,700 years ago, greekreporter.com notes. Now, both languages find themselves on the brink of extinction, and Calabrian Greeks, who are the last living trace of the Greek population who once formed “Magna Graecia” in ancient times, are striving to preserve their language. A brief history lesson tells us that Greek was in fact the dominant language and cultural influence throughout a large portion of Italy, including modern-day Calabria, Basilicata, Puglia, and eastern Sicily, up until the 14th century. Nevertheless, the introduction of Italo-Romance languages in the region, paired with the tumultuous and isolating geography, caused the Greek language to evolve into its own distinct dialect. In fact, it became two Greek dialects, one spoken in Calabria, named “Greko”; and another spoken in Puglia, called “Griko”. “Greko” is spoken in a very limited number of villages by an estimated 200-300 people total in Calabria (although some reports state there are a couple thousand individuals who still speak Greko). These villages are located on the slopes of the Aspromonte Massif in southern Calabria. They include the towns of Bova, Bova Marina, Condofuri, Gallicianò, and Rochudi Nuovo, as well as several other small towns by the coast. This Calabrian area is still referred to as “Area Grecanica”. “Griko”, on the other hand, is spoken in the southern area of Salento, Apulia, and especially in the villages of Calimera, Martignano, Martano, Sternatia, Zollino, Corigliano d’Otranto, and Castrignano. This area is known as “Grecìa Salentina”. With a high estimate of only 20,000 peoplemostly elderly, speaking Griko today, there is reason to fear that this ancient language may soon die off. Some estimate place the actual number at only around 2,000 total individuals. In some ways, the isolation of these ethnic Greek villages, high up on the slopes of various mountain ranges, or in valleys in Calabria and Salento, served a critical role in helping preserve these ancient Greek dialects, as well as the communities’ rich oral tradition and folklore. The languages are simply referred to jointly as “Calabrian Greek” in the UNESCO “Red Book” of endangered languages, where they is listed as “severely endangered”. 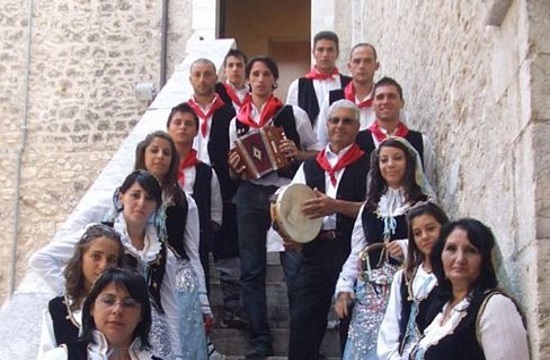 Nevertheless, Calabrian Greeks are not giving up on preserving their language and heritage. One way they are trying to save the linguistic history of Calabria is by offering online courses in Greko. Olimpia Squillaci is a young Calabrain Greek who established the “Greko Language Summer School”. This industrious and driven young woman has also developed a Greko-Italian/Italian-Greko dictionary app, and established the first Greko online course! She grew up speaking Greko thanks to the decision made many years ago by her father to speak with her and her sister only in Greko, as she points out in the video below. Squillaci received her PhD. from Cambridge University, focusing on language contact between Greko and the local Romance dialect, Bovese. You can watch her express her passion for her Greko language and her pride in her Greek/Italian/Calabrese culture in her own words below. The first 0-:39 of the video is in Greko and the rest is in Italian. Squillaci is not alone in her effort to save Calabrian Greek. She is a part of the Greko Cultural Association, called “Ellenofona Jalò tu Vua”, through which the summer school and classes are offered. The organization is currently working on a program titled “Adopt the Calabrian Greek Language.” The program is offered from October 2018 to July 2019 and features free Greko language workshops. Only time will tell if this new generation of young Greko and Griko Calabrian Greek speakers will be able to preserve their language for the planet to enjoy and appreciate.